Special Aircraft Transport International Company GIE, formed October 1991 as joint venture between Aerospatiale of France and Daimler-Benz Aerospace Airbus of Germany to develop a successor to the Super Guppy outsized freighter used to carry large Airbus airliner assemblies between factories in Europe. Resulting A300-600ST Super Transporter, known also as Beluga, based on A300-600R but with many important modifications including a completely new upper fuselage section to provide a freight hold of 24 ft 3 in (7.4 m) cross-section, with access via the largest door ever installed on an aircraft (upward-opening); cockpit moved forward and below cargo deck; new tailplane with endfins. The first A300-600ST Super Transporter flew on September 13, 1994, and after 335 test hours, was certified in October 1995. This aircraft went into service in January 1996. The second Beluga first flew on March 26, 1996 and the third on April 21, 1997 (last of five ordered for delivery in 2001). The Belugas took over the complete ferrying operations for Airbus major assemblies in October 1996. The cockpit has been lowered to get a platform for easier loading, and the A300-600 is equipped with a 100% digital control system (fly-by-wire). 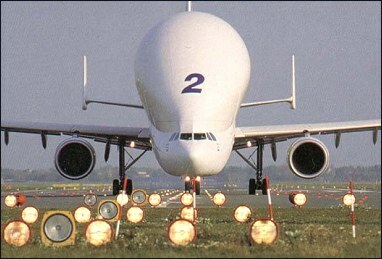 With its internal diameter of 7.62m, the Beluga can of carry a set of A340 wings or two pairs of wings for the A320.